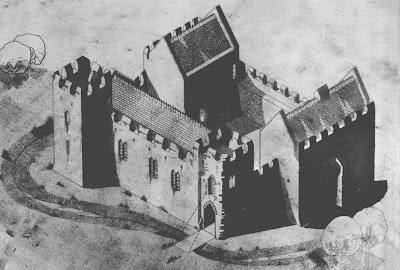 If you are looking for a way to kill some time on the internet - look no further: WELSH CASTLE INDEX. 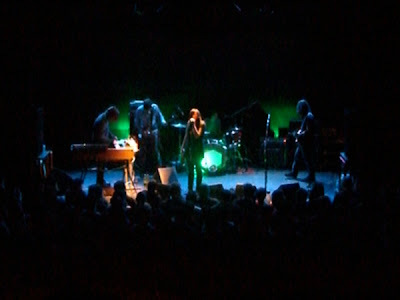 Black Mountain at Bowery last night knocked our socks off. If there is such a think as elegant head rock, this is it. They play tonight in Williamsburg according to Aaron, who has the Village Voice tattooed on his forearm each week. If you know the Bowery Ballroom, you may be familiar with the two velvet-curtained VIPish alcoves adjacent the balcony bar. We snagged one early and took turns impersonating Stevie Nicks while we waited through the opening act...but that's not the sort of thing I should discuss here. Ended up at Hotel Delmano...a newish cocktail spot in Bburg where everyone sports an ironic mustache. Go - if nothing else for the beautiful bathroom which I was about to snap a picture of before I realized that, in general, one should refrain from casually snapping pictures in the ladies room. Finally tried your Kale quesadilla for lunch....it was yummy.